There are lots of companies that have a variety of products that are aimed at assisting consumers to achieve energy consumption reduction objectives. 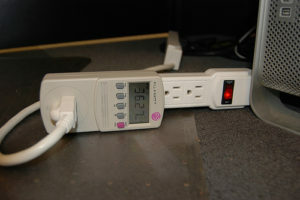 This particular one allows you to monitor the electricity used by a particular device that is plugged into it. You can observe how much energy is being used while the device that is plugged into is on. As well you can monitor how much energy is being used while that same device is turned off. This may be a revelation to many people, but our appliances increasingly are using energy while they are turned off, so they can instantly turn on when we need them. In our society, at the present time, no one is willing to wait while a device warms up and begins to work as designed. Instant on is everywhere and unknowingly to many people continue to use a small amount of electricity. You can purchase one of these meters to monitor just how much is being used if you are really serious about energy consumption reduction. Following this basic set of principles will ensure that your energy use is kept to a minimum with our without one of these expensive energy monitors. Franky, although they are kind of neat to have and you can have specific information about your appliances, these devices are just not needed for the average consumer. Save your money and just turn off appliances and / or unplug them when they are not being used. So many people get caught up on the complexities of dealing with controlling their energy use, rates, monitors, complicated thermostats etc etc. The simple rule we outlined above is all you really need to do to reduce your energy consumption and save money. It is really that simple. Once you develop the habit of turning things off, it will come as second nature. Always monitor your energy bills for heating and electricity. If you notice something changing, you may want to take some action to figure out why there is a change in energy use. In most cases a decrease is a great thing and very acceptable, however increases could be because of something abnormal that happened in your life or some one in your family forgot to unplug a heavy energy using device. But most things are small users, however when you apply a general rule of unplugging devices and appliances you will notice a difference in your energy consumption. Check also against seasonal changes. For example if the winter was unusually cold you may notice that your electricity use is up. So is your heating fuel consumption. This is to be expected. You may want to consider what you can do to control your energy use in this case. Same thing in the summer time when air conditioning is typically in use. Take advantage of varying energy rates by time of day if they are offered in your area. These are just a few things you can do to reduce the energy consumption when using your car. There are many more which you can apply to your personal life.